The 19th Dynasty, despite its later luminaries, began on a fairly low note. Ramses I, from whom the main part of the period takes its name, 'Ramesside', came to be pharaoh almost by default. 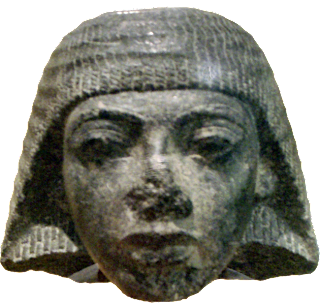 He was previously the vizier, close friend and confidant of the pharaoh Horemheb, who - having failed to produce an heir - appears to have bestowed the succession on his comrade. Ramses must have been of advanced years, probably into his fifties, and was not of royal blood. He was a 'career' army officer, the son of the troop commander, Seti. Their family came from the north-eastern Delta area of Avaris, the capital of the Hyksos invaders of 400 years earlier. The short reign of Ramses I, probably only about two years, gave him hardly any time to make his mark on history. There are some reliefs on the Second Pylon at Karnak and a stele dated early in his second regnal year found at Wadi Haifa. His small tomb in the Valley of the Kings (KV 16) was found by Belzoni on 10/11 October 1817 and showed all the signs of a hasty interment. The burial chamber was unfinished, in fact it had been intended to be merely an antechamber to a much larger tomb. As so often, the tomb had been robbed in antiquity, although some of the burial provisions still remained, notably the large granite sarcophagus, a pair of almost 6Vi-ft (2-m) high wooden statues of the king once covered with thin gold foil, and a number of wooden statuettes of underworld deities with curious animal heads. Robbers had damaged the sarcophagus as they prised the lid off and there is evidence that they actually hurled some of the smaller statuettes against the tomb walls in destructive fury, since tiny slivers of gold foil have been observed attached to the painted plaster. Ramses' mummy may not have survived (it certainly has not been identified), although it does appear to have been taken from the tomb before 968 BC, around the time when a number of the royal mummies were being moved to safety, eventually to be deposited in the tombs of Amenhotep II (KV 35) and Queen Inhapi (DB 320). The burial of Ramses wife, Queen Sitre, broke with earlier traditions where the queen was apparently buried in her husband's tomb at a later date, if she outlived him. Sitre's tomb set a new precedent: it was placed in what is now known as the Valley of the Queens at Thebes. Like her husband's tomb, Sitre's (QV 38) was unfinished, with only a few paintings on the walls of the first chamber.